Blend all ingredients together except for the cacao nibs/chocolate chips. Pour mixture into popsicle moulds, make sure to leave a bit of room at the top. 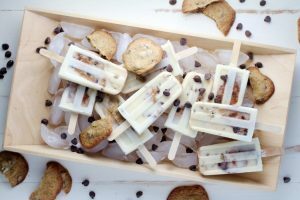 Add 1/2 tbsp of chocolate chips to each popsicle mould and stir gently with popsicle stick. Once all are in place, freeze for 2-3 hours until firm.